Listenwise stories are engaging for students and adults, so why not try using Listenwise to engage your students’ parents and families? Listenwise Premium is accessible at home and can be used on any device connected to the Internet. 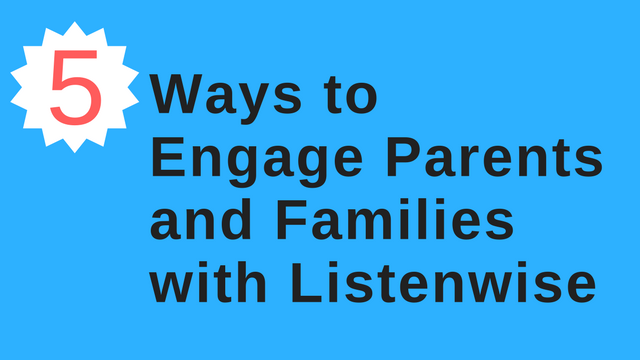 Here are 5 ways to promote listening outside of the classroom– by engaging families at home! Assign a Story. Assign students a story to listen to as a “Dinner Table Discussion.” Students listen to the story with a parent or adult at home and then discuss the issues using one or two listening comprehension questions that were assigned. They could take notes on the discussion and be ready to share the experience in class the next day. Students Choose a Story. Students choose a story to listen to with their families. They can create their own questions to use during family discussions and then share what sparked their curiosity and interest in the specific story that they chose. Parents and Students Choose a Story. Students and parents can listen to a story together and discuss one thing they learned, one thing they had a question about and one thing that surprised them about the story. If they choose a Friday Current Event Debate, they can listen to the story, state their argument and provide evidence to support their thinking. Parents take a Quiz. After students complete a quiz, have them listen to the story again at home with a parent or sibling. Students can read the questions to their parent or sibling and then let them know how many they got correct. In class, students can discuss the answers or listen again. Try out some of these activities to include parents in their child’s learning. Parents and adults can help improve a child’s critical and analytical thinking skills, debate skills, and help them connect to events happening in the world. This can provide a way for families to learn more about each other’s opinions and interests and provide a new avenue to connect and listen to each other. You may want to have parents start with a few of these stories. NOTE: We’ve also created a sample email you can send to your students’ parents or adults at home about listening together with Listenwise. ← Data Shows Practicing Listening Works!